Outline of dielectric constants: What are dielectric constants? An outline of capacitance: What is capacitance? Capacitance can be said to be the capacity to store electrical energy. Capacitance is the measure of the electric charge that can be stored by two conductors separated by an insulator.It is called "capacitance" in English. Let’s compare capacitance to water storage. Just as we can express as a volume the amount of water stored at a certain water level in a given sized tank, capacitance expresses the amount of electricity stored. As we said above, capacitance always exists between two conductive objects as long as they are separated by some amount of air. The amount of capacitance is determined by the distance between the two conductive objects, their shapes, and nature of the space between the two conductive objects. For example, if you place two metal plates parallel to each other and apply electricity, there will be capacitance in the space between the two plates. Capacitance C is determined by plate area S, the distance between the plates L, and dielectric constant ε of the insulation between the two plates. If S is equal to L, the capacitance C changes according to the dielectric constant εs of the insulator. Capacitance level equipment captures changes in capacitance C and thereby detects and measures substances. Capacitance is expressed by C. Its unit is the farad (F). 1 pico Farad (pF)=One-millionth of a micro Farad (μF). This is one trillionth of a Farad. are used. Our product leaflets use pF to express capacitance. If the dielectric constant changes from 1.0 (the dielectric constant of air) to 80 (the dielectric constant of water), capacitance C changes accordingly. So, that means water has occupied the space.Well, what are the dielectric constants of various substances? Below we explain briefly dielectric constant value to detect material levels using capacitance level meters. An outline of dielectric constants: What are dielectric constants? The dielectric constant (that is, the relative dielectric constant) refers to the basic electric constant characteristic of insulating substances, regardless of whether they are gases, liquids, or solids.Each substance has its own unique dielectric constant. Its value is determined how electrons in the substance respond when they are subjected to electricity. The dielectric constant is a constant of insulating substances, but conductive substances also have this constant. Semiconductors have dielectric constants. Substances that seem to be conductive may also have dielectric constants. The difference in terms of electrical action between conductive and insulating substances is derived from whether or not they contain free electrons (electrons that can move freely). Electricity cannot flow in an insulator because there are no free electrons in it. If an insulator is put in an electric field, electrical polarization occurs. The strength or weakness of this polarization creates the relative differences of dielectric constants. This phenomenon causes variations of capacitance. Sorry, but there’s a bit more to say about this topic. The dielectric constant of a vacuum is considered to be 1.0 (and of air is approx. 1.0). That of water is approx. 80. * Conductive substances have higher dielectric constants. Insulating substances have lower dielectric constants. The dielectric constant of some substances changes as their physical state changes (i.e., whether they are powdered or lumpy). Dielectric constants of typical substances. 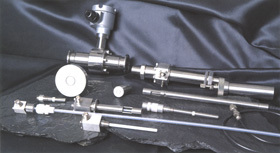 Below the relative dielectric constants of some typical substances are shown. * The relative dielectric constant refers to the ratio (e/e0) between dielectric constant e and the dielectric constant of a vacuume0. Any insulating substance has a larger dielectric constant than a vacuum. So, we can measure the presence and amount of various substances (materials to be measured), as well as the ratios of mixtures, and densities by measuring dielectric constants using the phenomenon of capacitance. Using capacitance and dielectric constants, we can detect and measure levels of various substances. Click here to see details of the dielectric constants of substances (materials to be measured). The capacitance in a system changes because of the characteristics of a substance passed between two metal plates (conductors) as described in the previous chapter. Capacitance also changes if the areas of the metal plates and/or the distance between the two plates changes. If the area of the metal plates is decreased by 1/2, the capacitance also drops by 1/2. If the area increases to 2x, the capacitance also increases to 2x. Therefore, as the capacitance is determined by the conditions of the conductor, formulas are provided to obtain capacitances for simple shapes of conductive objects. Below there are formulas to obtain capacitance C for 4 types of electrodes. However, in general, it is not possible to calculate capacitances so neatly, because the electrodes do not generally have such ideal shapes. To measure the capacitance in the real world, Capacitance measuring equipment must be used. On the left there are various sensor shapes that are used for measuring capacitance. We design sensor electrodes to match the material to be measured and the measurement environment, based on our years of experience and accumulated know-how.